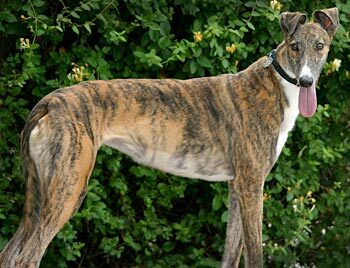 Hannah, aka Delray Hannah, is a beautiful, 4-year-old brindle female born October 30, 2006. Her sire is Dodgem By Design, making her grand sire the late, famous Gable Dodge, and her dam is Tyviille Miss Deb, making her grand sire the late, famous Molotov. What a heritage! Hannah’s racing career started August 3, 2008, at Dubuque in Iowa, moving to Valley Race Park in Harlingen, TX, moving back to Dubuque, and finishing at Gulf. 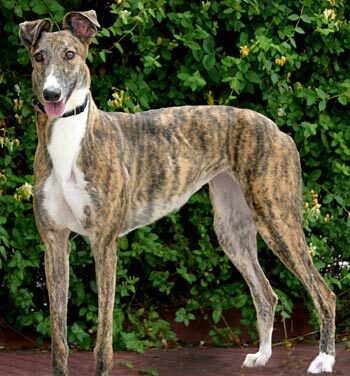 Hannah’s racing career of 63 races came to a screeching halt on Friday evening, February 12, 2010, at Gulf Greyhound Park in La Marque, TX, when she fractured her right central tarsal bone. Hannah was transported by a GALT volunteer to Austin, where she underwent surgery with Dr. Alice Runk of Central Texas Veterinary Specialty Hospital on Tuesday, February 16. She was released from Dr. Runk's care on May 20. 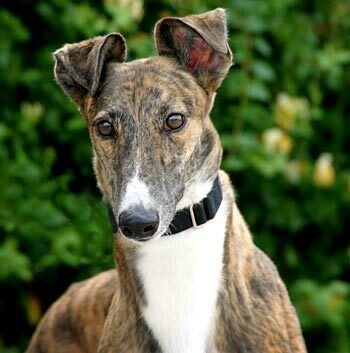 Hannah was in a home for several months, but due to no fault of her own it was not destined to be her forever home. Hannah is not cat tolerant. She will be tested with small dogs at a later time.